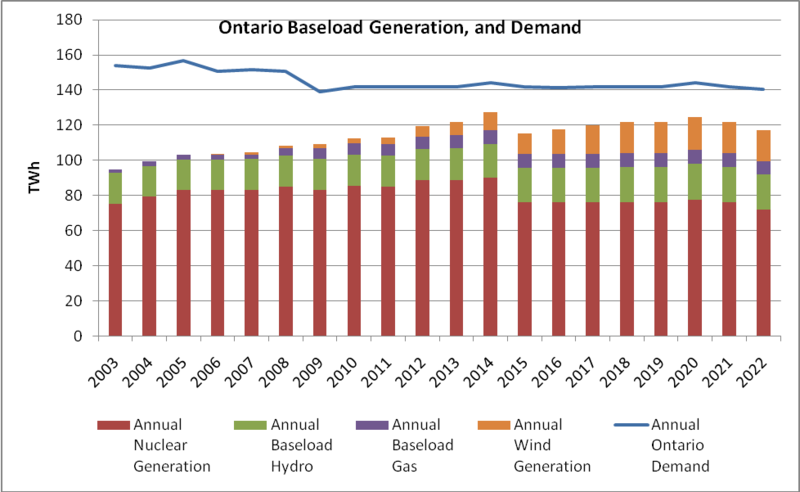 One of my goals is to determine the need for peaking capacity if more Industrial Wind Turbines (IWT’s) are added, but another is to provide a better accounting of the costs of the Ontario government’s grand experiment, inserting wind into a supply mix already dominated by a large contingent of baseload nuclear and non-reservoir hydroelectric generation. My first post in the series showed the planned IWT capacity is essentially planned as excess capacity, and illustrated wind’s variant output, especially it's lowest output period, of summer, coinciding with the peak supply/demand requirement. 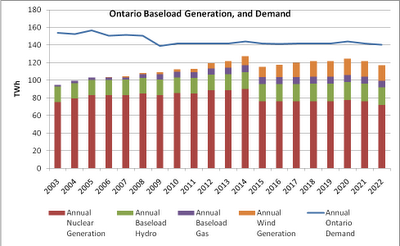 The second post developed the concept of ‘baseload’ supply in Ontario, based on summary estimates of daily output. 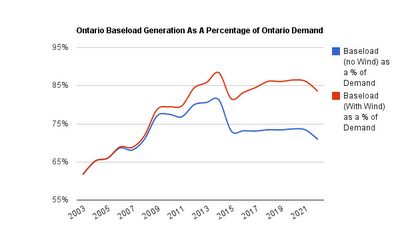 My definition of baseload included supply we were contractually obligated to take (or to pay not to take). Today I’ll start putting price tags on the choices our government has been making for us. SBG, for surplus baseload generation, entered the vocabulary in 2009. The system operator (IESO) has become very proficient in taking actions to reduce supply, which keeps the electricity grid functioning. It also keeps the issue out of the news. This spring I charted methods the IESO uses to reduce supply: steam bypass at Bruce B reactors (usually #6 and/or #7); simply letting water bypass turbines; and having non-utility generators (NUG’s) cut supply. I surmised we paid for each of those things, and in fact May did achieve both the highest commodity charge of the year and the highest Global Adjustment charge ever. Undeterred by the economics that dictate this approach is lunacy, Ontario continues to plan additional capacity that lacks load-following ability. The system operator, recognizing the increasing danger of too much supply to the grid, has now settled on the structure of a centralized forecasting solution – seemingly to allow payment to IWT generators when their output cannot be accepted onto the grid. I am yet to see any estimate on how much generation we may pay to prevent occurring. This chart indicates the actual demand figures up until this month. The graphics shown today are based on some historical data on production and consumption, some future forecast taken from government bodies and industry lobby groups, and the modeling of all these pieces into an hourly data set from January 1st 2003 to December 31st 2022. While these annual figures show some room for error, more so than the daily graphs of my last post, it is deceptive when the data is broken down to the level of one hour. $3.3 billion dollars is the first cost, if all goes according to my plan, which, failing an error, is simply calculating the outcomes of the government's choices. The first cost is by no means the only cost. The model that computes these figures has not yet accounted for the remainder of our hydro (only for the portion we've modeled as baseload). There is a lot more unnecessary production than I've indicated thus far. I will extend the model to account for the emissions-free hydro supply. That will be the next cost. іn delicіous. And certainly, thanks to уour еffort!